Looking for something new and unique to do on your next corporate or family outing? Our Camp Sabra facilities create the perfect location for your next event. 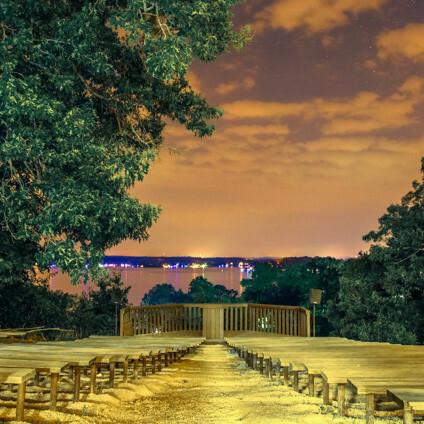 Our high and low challenge ropes courses are great for team building, our outdoor amenities are perfect for hosting birthdays, reunions and more, and our location on the Lake of the Ozarks makes for a beautiful setting for any event. 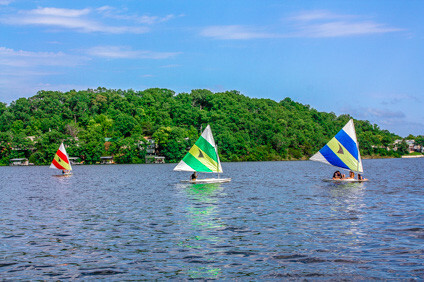 Camp Sabra is located midway between St. Louis and Kansas City, Missouri on the Staenberg Peninsula at the beautiful Lake of the Ozarks. Our peninsula sits on the Gravois arm of the lake, about 12.5 miles from Eldon, Missouri. Our three and a half miles of private waterfront include two coves with swimming areas, a water-ski area and a large fleet of sailboats, funyaks, paddleboards, canoes and water toys. Our grounds also feature a large, in-ground pool, human foosball court, extensive athletic fields, lighted tennis courts, and several volleyball and basketball courts. Camp Sabra’s 205 wooded acres remain mostly undeveloped, encouraging our visitors to connect with nature. It is in these areas that you can challenge yourself on our extensive high and low challenge ropes courses, 18-foot climbing wall, zip line, archery range and more. 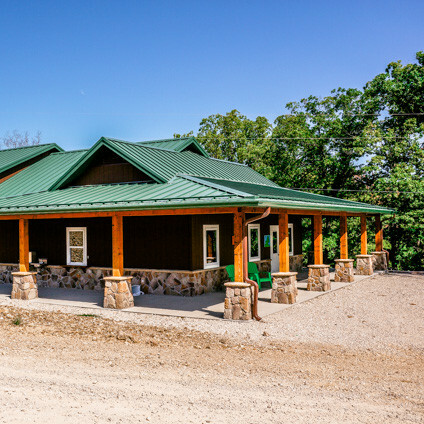 Our expansive acreage also includes 10 miles of mountain-biking and hiking trails. Our facilities are continually being renewed and refreshed. Recent additions to Camp Sabra include new cabins, shower houses and the Fox Family Theatre, with more upgrades scheduled for completion before the summer of 2016. Additionally, Camp Sabra features a chapel, a large, air-conditioned dining hall and an air-conditioned arts and crafts facility. Families use Camp Sabra for special occasions like birthdays, reunions and Bar/Bat Mitzvahs. Schools use Camp Sabra for events like 6th grade and 7th grade camp, and high schools join us for athletic camps and retreats. Corporations use Camp Sabra for retreats, corporate outings, team-building exercises and celebration getaways. Non-profits find Camp Sabra useful for employee retreats and even creating their own camp to serve specific groups. Temples use Camp Sabra for special Shabbats, getaways and alternative holiday celebrations. If your group would like to rent our beautiful facility, please contact Assistant Camp Director Ben Panet.